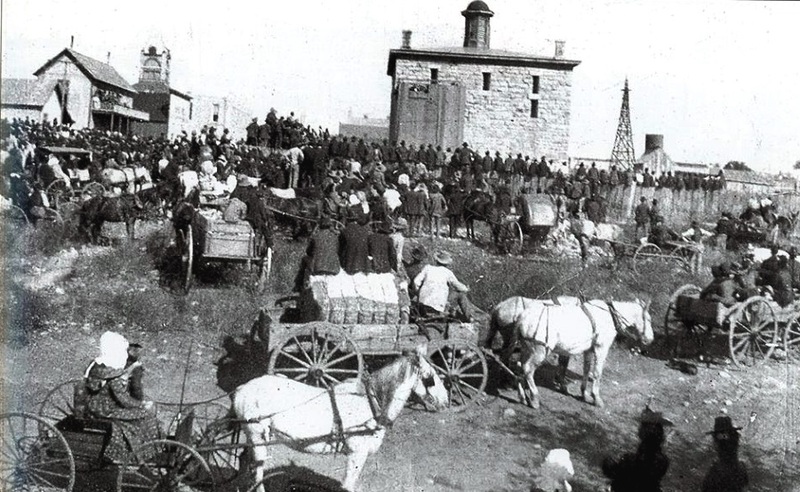 On November 10, 1899 a crowd of 4,000 gathered in Stephenville, Texas for the last public execution in Erath County. What led to the hanging of Tom Wright who had been convicted of shooting and killing Constable John Adams in nearby Dublin is detailed in newspaper reports of the time. This article includes Wright's final testimony and letters to the Governor pleading that Wright's life be spared. Wright's trouble with the law started about 8 years prior to the hanging. He was charged frequently with violating the law, especially the local option law. He and John Adams, constable of the Dublin precinct, had clashed on many occasions. In 1891 a Mexican’s house was set fire and burned in Dublin. Wright was arrested by Adams and convicted on the charge and sentenced to six years in the penitentiary for arson. After serving two years he was pardoned by Gov. Hogg and returned to Erath County. Wright was watched constantly by Adams and arrested from time to time for violating the law. A mutual dislike grew between the two men. Wright told Adams that the Constable had the wrong information and that he wanted to talk the matter over with him. Adams replied “No, I have it in black and white that you have tried on three different occasions to hire persons to kill me and it cannot be explained.” Bystanders stopped the argument and nothing more was said at that time. On the following morning, Frank Leslie remarked to a clerk at Latham’s that “it is coming off today. "; When the clerk asked what, he said ";Wright is going to kill Adams, if his nerve did not give down,” adding that he “would bet his nerve failed him.” But Wright’s nerve did not fail him. About 5 o’clock on the afternoon of Dec. 18, 1897 the transfer bus drove down Black Jack street from the Rio Grande Depot, after the arrival of the afternoon train, and stopped at the crossing of Patrick Street. The driver called to John Adams, who was passing by, to open the rear door of the bus and let little Jesse Maloney out. Adams started to open the door, and just as it swung open the fatal shot was fired from behind by Tom Wright. Wright walked to the sidewalk, talked a few minutes to someone, while Adams’ body was being moved out of the street, then returned to the bloody spot. Waving the gun over his head again he repeated the words about Adams. City Marshal Jesse Philips placed Wright under arrest. The preliminary trial was held before Esquire W. E Lowe, of Dublin, who remanded Wright without bail. A writ of habeas corpus was sued out before Judge Straugham, who also refused bail for Wright. The case was taken to the Court of Appeals with the same results. On May 5, 1898 the grand jury returned a bill against Wright for murder in the first degree, and the case came to trial in the same term of court. Wright was defended by R.H. McCain, Taylor Daniels, and Rev. J. T. Harris, none of whom had ever had much experience in criminal practice. The prosecution was conducted by District Attorney J. W. Parker and and one or two others. The defense moved for a change of venue, however after one or two days of hearings the motion was overruled. On the 16th day of May the trial began and on May 23 the jury returned a verdict of guilty and assessed the punishment at death.. A motion for a new trial was made on June I, but was overruled. An appeal was taken to the Court of Criminal Appeals, and that court affirmed the decision of the district court. Judge Hurt of Dallas was called into the case when it went to the Court of Appeals. In their decision the court ruled several grounds which they could not consider because the defendant’s attorneys had not excepted during the trial. At the return of the mandate at the last October term of the Erath District Court, Judge Straughban sentenced Wright to be hanged Nov. IO, 1899. After the day of the hanging had been set, a petition was signed by several residents of Erath County and sent to the board of pardons at Austin praying that the sentence be commuted to life imprisonment. The board of pardons, joined by the state attorney general, unanimously reported in favor of the commutation, but on October 28 Governor Joseph D. Sayers refused to accept the report and ordered the sheriff to proceed with the execution. On. Nov. 4 several members of the Erath County Bar signed a petition and letter to the governor which were taken to Austin 6 days before the scheduled execution by the wife of the condemned man. The petition was signed by W. T. Carlton, B. E. Cook, J. D. Berry, J. E. McCarty, J. T. Daniel, M. J. Thompson, C. Nugent, Jas. U. Vincent, J. B. Keith, J. W. Jarrott, J. M. Carter , J. W. Moss, Thos. B. King, William Pannill, J. E. Sanders and G. W. Hughet. After learning the final decision of the governor, Tom Wright made written statements where he exonerates Frank Leslie, outlines his theory of a plot by Gus Blassengame and Green Harrison, that led to both Constable Adam's death and his hanging. He thanks A. P. Hickey, J. D. Jackson and Bob Smallwood for kindness they showed him while in prison. He forgives those who wronged him and asks forgiveness for himself.